Here is a dual-wheel display of 2 charts for the Tea Party Convention set for Feb 4 and 6, 2010, Nashville, Tennessee - symbolically, the Convention's start and its end. Quite a few details are written on the charts so I hope my notes are readable if you click the image to enlarge. Upper right: Feb 4, 2010, sunrise 6:49:58 am CST, Sun/ASC 15AQ36 (bringing up Sarah Palin's natal Sun-Mars-Saturn conjunction (22 - 26AQ); Hour of Saturn; Disseminating Sun/Moon phase = gettin' out the info, or propaganda, depending on how you perceive Politics. Moon begins in late Libra (27:41 @ sunrise) and asteroid Hidalgo (one of the 'power' asteroids/myths) is at Mc (the WHY? Point) of the sunrise chart (or 'solar chart' which I use here to describe the purpose of the day and the Convention itself, Feb 4); at left you see Mrs. Palin's natal planets listed. self-assertion; a rebel with a cause; expects to be in charge; a revolutionary patriot (such as its namesake, Miguel Hidalgo y Costillas, a Mexican priest who is known as a 'champion of liberty'.) Perhaps a few words along these lines may be noticed before, during, and after Palin's keynote speech. In fact, these charts indicate to me that the event itself, a money-making endeavor that has caused two other speakers to bow out, is in part a showcase for Mrs. Palin's future political dreams of grandeur and social improvement. And with the ongoing Mars Rx period affecting Mrs. Palin's natal Moon (5AQ) by opposition, there is much energy crackling around her now (including her FOX News contract.) Yet with her hectic schedule, Palin may be late in arriving or beginning her speech. (I believe this is par for her course, however, for whatever reasons.) Mars opposing natal Moon can bring anger or quarrels into one's environment, equipment breakdowns, intense emotions, or...debates. But perhaps that's only if she can call you, Joe. And if Mrs. Palin's efforts toward success do pay off, a large payback will probably be required. Will she be - or remain - willing to pay the price? Is her Tea Party performance an audition for a higher position? Hidalgo's myth carries a 'lower nobility' flavor ('don') of one who desires to move up in society to a 'higher nobility.' And in Celtic myth, 'don' is associated with the mother archtype. Mrs. Palin certainly is that, yet 'glamorous woman' Lilith is one of her 'faces' as well. Well, now I must advise you that Art is upon my drafting table at the moment with an Art collaboration scheduled for Spring Equinox 2010, so I must soon mosey along since graphic work must be finalized pre-March 19. Also, in Georgia, an ice, sleet, or snow storm is said to be at my very door as I type so we'll see how that goes in the electricity department. So if you want to say anything about the charts you see here, the Tea Party event or movement, or the politicians hoping to rouse the masses from its stupor on Feb 4 - 6, please leave a comment here. Btw: I'm happy as a puppy with two tails to report that a few readers who have been silent until now, have spoken up to let me know they're reading - yay! Thanks, Guys. 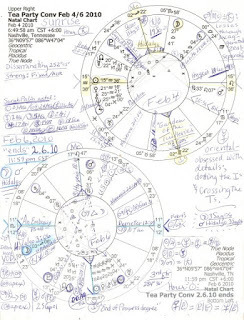 Why, those two interlaced YODs in the Feb 6 chart are enough to stir up a heap of trouble...they're listed lower left and show a 'special task' for Mars and for Jupiter, as Moon conjoins Hidalgo, and along the way, conjoins a few midpoint combos in Mrs. Palin's natal chart from '1Sag' to '4Sag'; I must note that '1Sag' is the "A Grand Army of the Republic Campfire" degree, which emphasizes revolutionary Hidalgo's 'patriot' flavor. The Tea Partiers will love and adore her on this score. N Sun/Uranus = tr Moon: rashness; nervous, excited, or agitated women; impulsiveness; a demand for need fulfilment; an intense woman. N Saturn/Uranus = tr Moon: emotional courage emerges under duress; changes for freedom; strong emotional strains; a sudden desire to liberate oneself from emotional stress (uh-oh! she's a maverick, y'know! ); separation from females. N Sun/Pluto = tr Moon: irritability, esp of women; illness; brutal suppression of feelings; attempts to project power and persuasion; feelings possibly trampled in relationship. N Saturn/Pluto = tr Moon: emotional coldness or rigidity of feeling; nunciation; giving up giving. Can this refer to her giving up tea, Tea Parties, or her association with the founder of the organization? Alternately, she may simply be exhausted and feel all used up by the time the Convention balloons are popped. Plus, the amount of profits in ticket receipts will color everyone's attitude when the party ends, the lights go down, and Hidalgo-as-Pied-Piper has sung her siren's song of power, patrons, and patriotism. Update Jan 29, 2010 8:48 pm est: here's a post concerning the 2010 Tea Party Convention's Sun/Moon blends from Feb 4 to Feb 6, as the Moon traverses Libra, Scorpio, and Sagittarius while the Sun remains in Aquarius; a bonus blend is included to cover the atmosphere of the immediate hours after the Convention ends on Feb 6...Sun AQ/Moon Capricorn. She and Michele Bachmann (the Minnesota State Representative who slobbered so unbecomingly over Bush II following his SOTU speech) are definitely from the same asteroid. I kid you not, the word verification for this post is "femster." Sounds like a pejorative. Yeah it is going on here in Nashville and several people have already bowed out ... my neocon Rep, Marsha Blackburn, and neocon Rep Michele Bachmann, who I still associate with being batsh*t crazy for that hiding in the bushes incident, saying God chose her to run for office and being pro-FISA. But she seems to have reinvented herself as a libertarian type these days.